Dahlias are native to the sunny highlands of central Mexico, where there is no frost and temperatures linger in the comfortable range between 40 and 80 degrees F. Since the American South endures frosty winters and, more importantly, long, hot and excessively humid summers, growing dahlias can be troublesome, if not simply depressing. Start tubers early indoors in early spring or midsummer, then transplant outdoors when spring and autumn temperatures promote the best leaf and flower development. In peninsular Florida, store tubers until October and then plant them outdoors in the ground to enjoy across the winter months. Fill a 3-gallon black plastic container with 6 inches of a high-quality, peat-based potting mix. (There's no need to purchase potting mixes with fertilizer already added, but do avoid topsoil and mixes that are heavy and dense in texture.) Make sure the plastic planting containers have at least one drainage hole in their bottoms. Place one dahlia tuber on the soil in the container and gently push it slightly into the soil. Sprinkle potting soil atop the tuber to a depth of 2 to 3 inches. Place the container in a sunny location in the house, where the temperatures remain between 50 and 80 degrees. Water the tubers as needed to keep the soil damp, but never soggy. Add 1 inch of soil to the container once the sprouting dahlia stems extend upward to the sunlight. Keep adding 1 inch of soil to keep the top of the leafy sprout's tip no more than 1 inch out of the soil. Stop adding soil when the soil line is about 2 inches from the top rim of the growing container. Transplant the dahlia plant to the garden outdoors after the last spring frost date in your location, or in September or October once typical daytime high temperatures hover around 75 to 82 degrees F.
Dig a hole in an area of your garden that is in full sun and has crumbly, fertile soil that drains well. Carefully remove the dahlia plant from the container and set it in a hole that is twice as wide as the container and as deep as the plant's root ball. Replace soil around the roots and gently tamp it down to complete the planting. Make sure the top of the dahlia's root ball is at the same level as the garden soil grade--neither too high nor too deep. Water the dahlia, providing about 2 to 3 inches of water to remove air pockets in the planting hole. Monitor the soil for the remainder of the growing season if natural rainfall doesn't keep the soil moist. Avoid creating a soil environment that is too dry or too soggy. Soil that is too soggy can cause root and stem rot. 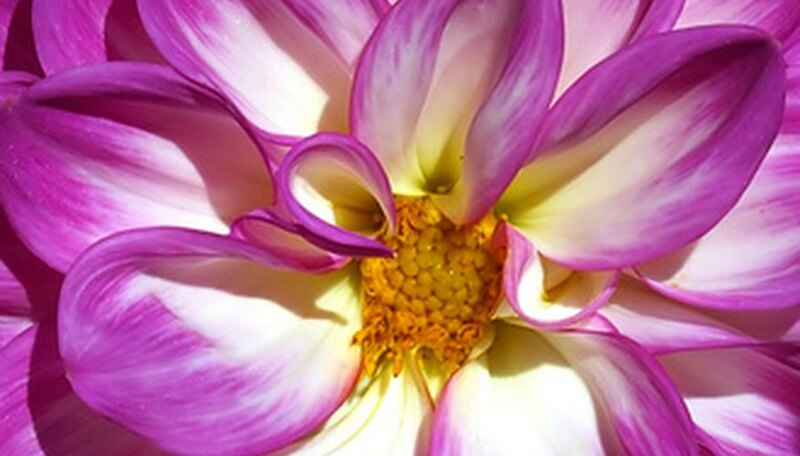 Fertilize the dahlia every two weeks with a liquid fertilizer product (10-15-10), according to label directions. Allow the dahlia to grow and produce flowers until the summer heat is excessive, or until the first fall frosts kill back the foliage. In the South, that typically means that dahlias started in spring and transplanted out in April may falter by late July, and those started indoors in July and planted out in September will get hit by frosts in November. Dig up the dahlia tubers and cut away the stems to force a dormancy. Remove any soil from the tubers and allow them to air-dry, then store them in a cool, dry location in coarse sawdust or shredded newspaper. Do not let tubers freeze or be exposed to light. Bring the dormant dahlia tubers out from storage in late February or mid-July to start them in pots indoors for later transplanting when the weather is amiable. Hot summer temperatures cause dahlia flowers to be slightly smaller in size than if the temperatures are cooler. Choose shorter-growing "border" dahlia varieties that will reach a mature size and begin flowering sooner, rather than types that tower several feet tall before any sign of the first flower bud. On the Florida peninsula, direct-plant the dahlia tubers in the soil anytime frost isn't an issue from October through February. Dahlias overwinter in USDA hardiness zones 8 through 10, but the soil must remain on the dry side to prevent tuber rot. Lift tubers and store indoors or heavily mulch the garden bed to keep the soil drier across winter. Dahlia tubers are available for sale mainly in spring. This means they may not be around in stores or shipping by mail-order nurseries at a time best for these steps, especially for Floridians. Store tubers in a cool, dry and dark place until the opportune time for planting occurs, but for no longer than 4 to 6 months. Plant tubers that are firm and plump. Throw away tubers that are shriveled, rotten or soft.